Prime Minister Holness is inviting more investors to tap into development opportunities in Jamaica, particularly in the tourism industry as he believes the trajectory of the value of the industry is going to take off rapidly. Amaterra Group Chairman, Keith Russell (second left) explains his development plans for the Amaterra Group’s first hotel site to Prime Minister, the Most Hon. Andrew Holness (centre), Minister of Industry, Commerce, Agriculture, Fisheries and Investments, Hon Audley Shaw (left), Minister of Tourism, Hon. Edmund Bartlett; and Amaterra Group Chairman, Paula Russell. 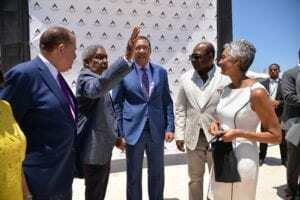 The occasion was the ground-breaking ceremony for Ameterra Group’s construction of an 800-room resort in Stewart Castle, Trelawny on Friday April 12, 2019.